fishing reports, sports, rock music...essentials minus oxygen and food. I must say I am a bit delinquent on blog posts but here is the deal, I absolutely love spring and have a really hard time getting motivated spending any more time then I absolutely have to staring at a screen…unless the giants are on or a short list of TV shows I DVR to watch late at night is on. The weather has been awesome and though I have a guilty feeling every time I revel in it as I know we are in a terrible drought and that we need some monsoon esque storms to move through….75-80 degrees and sunny. Fishing has been off and on but for the most part pretty damn good…I haven’t heard much about the opener but I have a hard time believing in drought year where most rivers, creeks, or lakes are fishable throwing flies at fish that haven’t seen them sense November good go bad. Here is my reports and what has been going on along with news on other things of great importance…sports, music, things. Lower Yuba River – So the Yuba is UP! Yay! Flows are up to 1100ish cfs but I am not sure how long that will last…hopefully awhile as it is nice to have the river back looking like a river and the Yuba I know and love. I don’t go there if the flows are around 500-750cfs…I hate it that low. I floated it Saturday with clients and the fishing was pretty damn good, as the Yuba goes about as good as it gets. We hooked lots of fish and landed multiple fish in most runs and many of the fish were in the 16-18” bracket with 1-2 that were pushing 20”. The fish seemed to be podded up but were moving into the flats and runs that had not had current in them at 500cfs. First time in months that I had fished the flats on the Yuba…loved it! Hot bugs were mayfly nymphs in the morning and caddis and rubber legs midday into the early evening. There were a few PMD’s and Caddis on the water from morning to midday but I couldn’t buy a fish on the surface. We got a few refusals that seemed like the fish were pretty apprehensive to eat a dry fly…from what I have heard they got pounded on dries for a good month. Afternoon and evening had a good number of little yellow sallies flying around but again we couldn’t get a fish to come up. 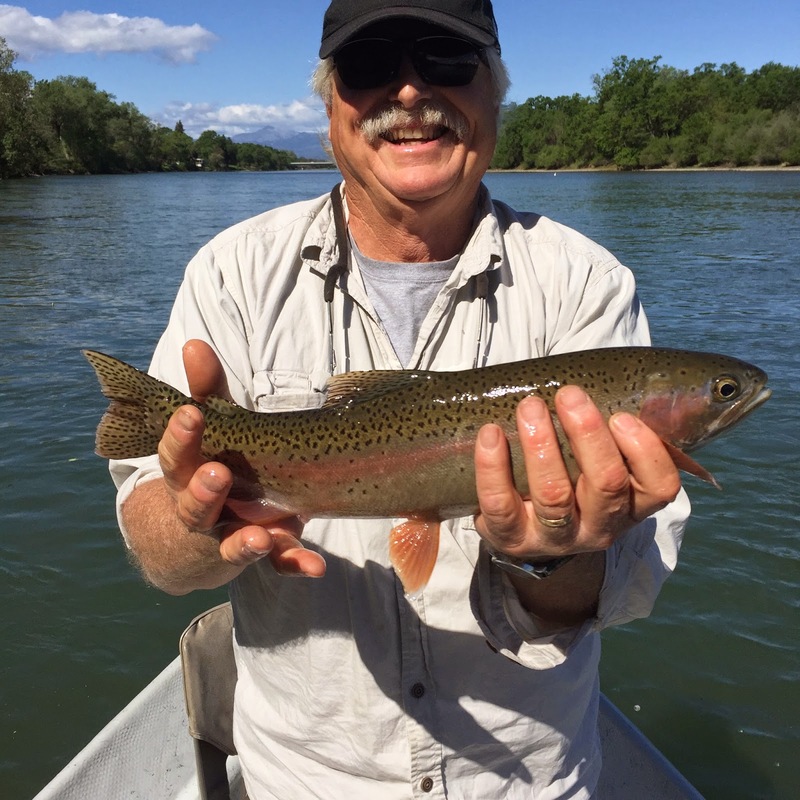 Lower Sacramento River Trout – Fishing seems to have calm down from the ridiculous fishing that March and Early April were offering. Fishing has been good during specific windows throughout the day on different stretches. For example fishing can be tough in the morning then good in the afternoon or vise versa on other stretches. That is pretty typical of this time of year as May can be a pretty tough month on the Lower Sac for trout. June-August fishing will pick up again in the lower stretches. Lower Sac Stripers, bass, and shad – fishing tightened up with the cold front that moved through that last week. I struggle to catch fish on the front or back end of a cold front out here. Prior to the cold front fishing was decent…getting a few stripers and bass and hearing rumors of shad. Water temps are in the 62-64 degree range which should get fish on the feed here soon as the weather stabilizes. Water clarity is an issue with a 1-2” of viz and a brown color to the water but with stripers I don’t worry to much about that…bass and shad I would feel better with some clearer water. 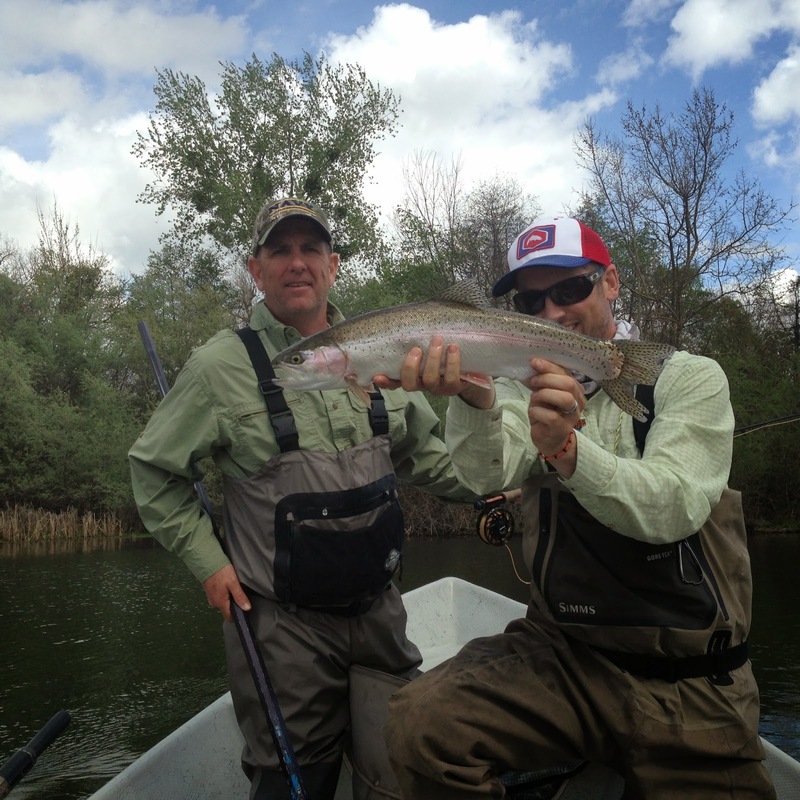 Lower Feather River Spring Steelhead – They are in and the recent rain moved a few fish around and up. Swinging flies and nymphing with caddis and basic attractors is still catching fish. Fishing should continue through Mid May but May slow down earlier with warmer weather as the flows are low and water temps could warm up. Water that is open – My goal is to get up to the NF Feather over the next few weeks as that is one of my favorite trout rivers to fish right after the opener as with the drought I think it is going to be a short window up there this year also I am looking forward to floating Pit 1 and getting my feet wet on Pit 3. I have a few dates booked up at Clearwater lodge so soon I’ll be up there. Sports News: All I have been watching is the Giants… So I would like to make a strong statement in that I was not one of the people pulling the fire alarm after we went 3-10 or even now that we are in last place 3.5 games back and sitting at 8-11. There are so many good things happening! Justin Maxwell?! Who would of thought. Our “thin” outfield now when Hunter comes back is all of sudden thick with 4 guys that can get it done and rotate throw keeping injury prone Pagan healthy and I don’t have to yell at Gregor as much or with such passion as I can just say oh he is a bench player giving a guy a rest…I can swallow his 0-5 and 1-4 nights much easier if I know he won’t be back in the line up for another week. Chris Heston…what a stud. Yes he had his “welcome to Coors Field” night but he still battled and kept going after hitters and getting it done. I worry a bit about Casey but hell Bochy has faith in him and I have faith in Bochy…though when Duffy comes in and plays so well it is hard to watch Casey hit into double play after double play. I am a bit concerned about the Vogie spot in the rotation but he did well last start and it sounds like they will let him start in LA against the Dodgers Wednesday against Greinke…we will see. Bottom line I love baseball and I am pretty confident when we get our guys back (Cain what is the deal with him) and our hitters start hitting we will be fine. That said the West is going to be a brawl. The Padres are for real, the dodgers are stacked and hell the Rockies and DBacks are not going to roll over this year. 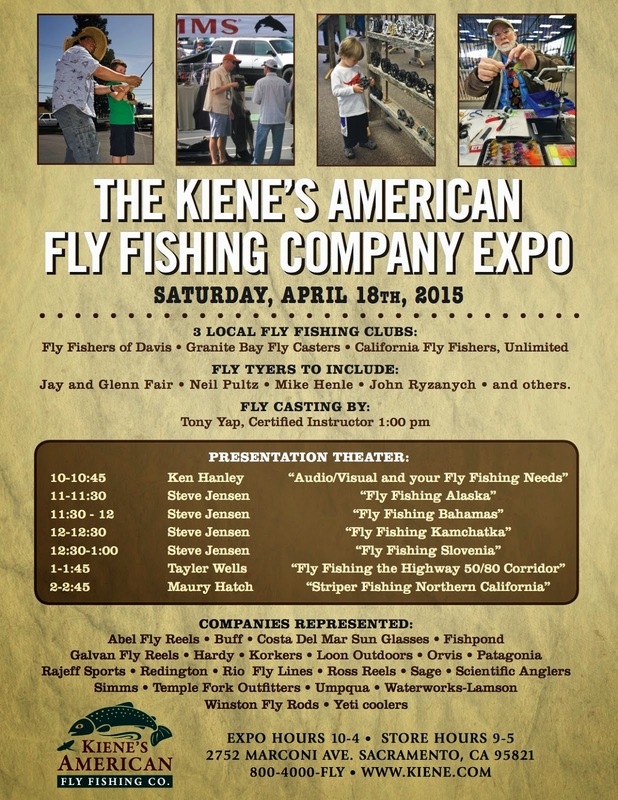 Just wanted to let everyone know I will be at the Kiene's American Fly Fishing Company this saturday with the Cast Hope Booth as well as helping with the Simms Booth. 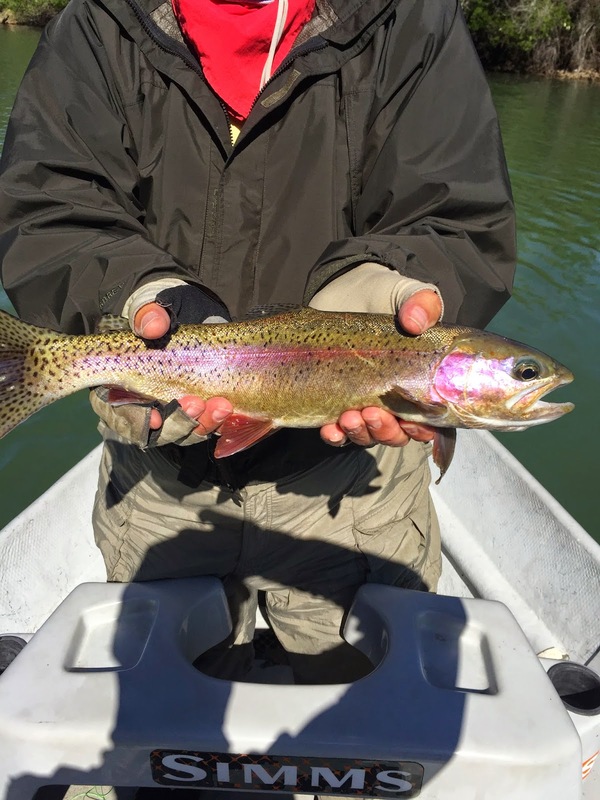 Lower Sacramento Trout – March is by far one of the best months on the Lower Sac. I have been fishing between Anderson and Jelly’s ferry mainly but did spend one day floating from Posse Grounds to Bonnie View. Fishing has been good to very good with LOTS of opportunities each day to hook fish. On some days the grabs have been very quick so hooking up can be a challenge others they seem to jump on the fly and the molasses I am dazing off watching birds hook set can get it done. Best bugs have been rubber legs, Hogan’s Amigo in Brown, Hogan’s March Madness Nymph, RK Flutulator in March Brown, #18 Amber Wing Prince, #18 Dark Lord, and a few other small mayfly type patterns. Clarity could be an issue with the recent rain as it rained pretty hard in a short amount of time but I am sure it will clear shortly if it is colored up. Lower Sacramento River Bass – I spent one day out exploring some spots for Largemouth and Smallmouth bass and it still seems a bit early. Water temps in the river are 57-59 and back in the sloughs the water temps barely get over 60 so with a window of 55-65 degrees to kick spawning in it should be any time. I fish sub surface pretty hard and found a few willing fish but no one on beds or looking like they were looking to spawn. Who knows though as the river is a tough one to figure out. Lower Yuba River – I continue to hear that fishing has been really good with great dry fly fishing but I continue to stay away with flows around 550cfs. The word on the street is that flows will come up to 1500cfs in May some time so as the Lower Sac is traditionally tough in May I will spend most of my trout days on the Lower Yuba. Lower Feather – Spring Steelhead - Fishing remains consistent for adult and half pound spring run steelhead. The recent rains should help move any fish that have been waiting up river. Swinging flies and drifting nymphs have been catching fish about as equally well. The giant spring caddis have started to hatch and swing flies on floating lines and intermediate tips along with fishing dry flies should get going through April. Not bad for the first fish of the morning. Trout Season – Opens here soon…a few weeks away. Fishing should be good early this year on most trout water. I will most likely get up to the NF Feather with in the first few weeks to get my licks in up there as with the drought fishing is going to be tough ounce the water warms up. I would say the best advice is go early this year. Don’t wait to long to get your trout days in as this summer is going to be a tough one for trout fishing in the mountains. …That said spring and summer striper fishing is going to be GOOD with limited interruptions from run off the stripers will be active and fishing should be good May-September. Low water means good weeds and great bait for our resident and migratory fish. Book early this year as dates are already getting taken up. Music Report – I have been all over the place lately…kinda on one of my Pandora kicks, listening to all my random stations on Pandora…my favorites are my Lucero Channel, Chuck Ragan Channel, and Ryan Adams Channel…… Gas Light Anthem Channel is good one to. I haven’t really bought any new Albums in awhile either even though I have listened to a ton of stuff on I Tunes looking for something to buy just haven’t pulled the trigger…. 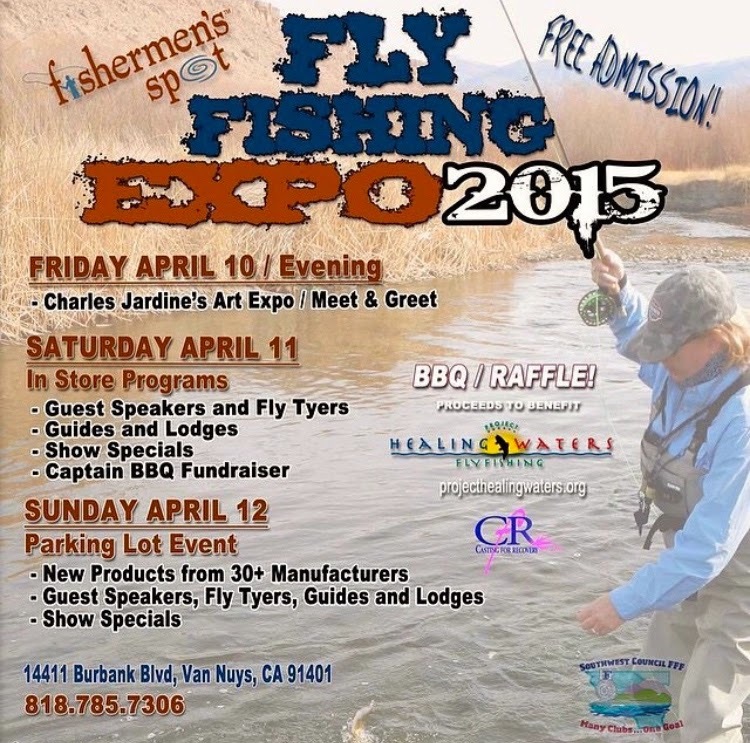 Appearances – IT IS FLY SHOP FAIR/EXPO SEASON!!! FREE BBQ, RAFFLES, PRESENTATIONS, AND NEW PRODUCT!!!! I will have the Cast Hope booth at the Kiene’s Expo on April 18th promoting what Cast Hope is doing in the Sacramento Area. The booth will be set up next to the Simms Fishing Products booth. Come one come all Nor Cal for free BBQ, new products, and raffles. Plus great conversation with me and anyone else hanging around the Cast Hope/Simms Booth.